Is it possible to eat well, drink wine, and still lose weight? Melanie Avalon is living proof that, heck yeah, it’s not only possible, it’s unbelievably simple and straightforward. 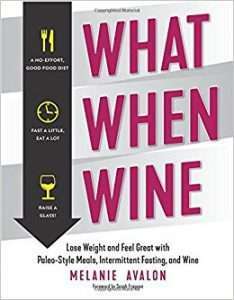 It’s all about the what (mostly Paleo, but she’s not a monster about it), the when (believe it or not, brief fasting can mean freedom rather than restriction), and the wine (red wine can be a secret bullet for weight loss—who knew?). It’s a combination that Avalon discovered after years of self-experimentation and intense research on the mechanics of body fat regulation. In What When Wine, Avalon shares her journey to a healthier lifestyle, with the tips and tricks she learned along the way, as well as a jumpstart plan including 50 delicious Paleo-friendly, gluten-free recipes by chef Ariane Resnick.